Generation of a large-scale genomic resource for functional and comparative genomics in Liriodendron tulipifera L.
Liriodendron tulipifera L., a member of Magnoliaceae in the order Magnoliales, has been used extensively as a reference species in studies on plant evolution. 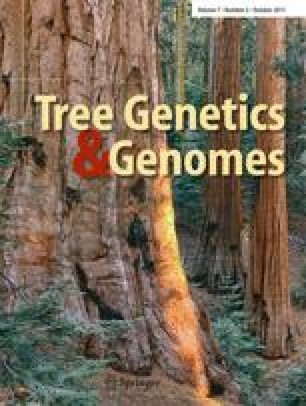 However, genomic resources for this tree species are limited. We constructed cDNA libraries from ten different types of tissues: premeiotic flower buds, postmeiotic flower buds, open flowers, developing fruit, terminal buds, leaves, cambium, xylem, roots, and seedlings. EST sequences were generated either by 454 GS FLX or Sanger methods. Assembly of almost 2.4 million sequencing reads from all libraries resulted in 137,923 unigenes (132,905 contigs and 4,599 singletons). About 50% of the unigenes had significant matches to publically available plant protein sequences, representing a wide variety of putative functions. Approximately 30,000 simple sequence repeats were identified. More than 97% of the cell wall formation genes in the Cell Wall Navigator and the MAIZEWALL databases are represented. The cinnamyl alcohol dehydrogenase (CAD) homologs identified in the L. tulipifera EST dataset showed different expression levels in the ten tissue types included in this study. In particular, the LtuCAD1 was found to partially recover the stiffness of the floral stems in the Arabidopsis thaliana CAD4 and CAD5 double mutant plants, of the LtuCAD1 in lignin biosynthesis. L. tulipifera genes have greater sequence similarity to homologs from other woody angiosperm species than to non-woody model plants. This large-scale genomic resour"HistryDatesce will be instrumental for gene discovery, cDNA microarray production, and marker-assisted breeding in L. tulipifera, and strengthen this species' role in comparative studies. The online version of this article (doi: 10.1007/s11295-011-0386-2) contains supplementary material, which is available to authorized users. We thank Stephan Schuster and Lynn Tomsho for their assistance in 454 sequencing, Yi Hu for RNA isolations, Denis S. Diloreto for seedlings, Stephen Ficklin for the mining of SSRs, and Xinguo Li for providing the pure xylem unigenes for Populus, loblolly pine, and white spruce. This study was mainly supported by the National Science Foundation grant, Ancestral Angiosperm Genome project (Award # DBI-0638595, PI: dePamphilis). A National Institute of Food and Agriculture, USDA grant to HL (project number SC-1700324, technical contribution No. 5832 of the Clemson University Experiment Station) contributed the sequencing of a one half 454 plate.